Interviews: Progressive Metal Upstarts Anthriel Score Big with Transcendence - Sea of Tranquility - The Web Destination for Progressive Music! 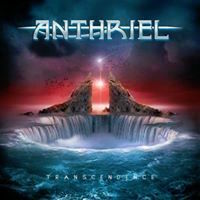 With their latest release for Lion Music, Transcendence, wowing fans & critics alike, Finnish progressive metal act Anthriel seem poised to enter into the big leagues. 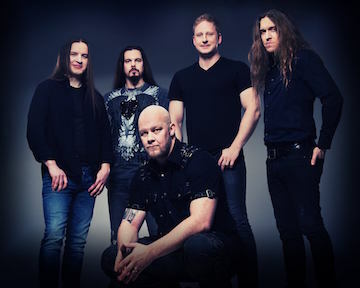 Sea of Tranquility Staff Writer Mark Antony Rossi recently caught up with members Simo Silvan (vocals) and Timo Niemistö (guitars) to discuss the stellar new album, their songwriting style, influences, and the Finnish music scene. SoT: After reviewing the album and even reading a sort of self-interview included in the press kit I am astounded on how candid your revelations and your lyrics are in tackling life's peaks and valleys. Have the setbacks caused the members of the band to grow as people and possibly musicians? Simo: Yeah, well I believe that the hard times have changed us as who we are as individuals and gave us more feelings and thoughts to write upon but maybe not so much as musicians. SoT: You mentioned this album is "darker" than your previous effort. But as I listen to The Oath of Darkness I don't hear black metal blasphemy or rancid roaring rampaging across the uni- verse. It's well thought out and executed. Can you elaborate on some of the elements of the songs on this album? Simo: Yes, we did call it much darker and heavier cause when comparing Transcen- dence to The Pathway, it really is quite a bit darker. I used lots of elements I've picked up while reading different fantasy novels to describe things on this album and twisted them in my head to meet my purposes while writing the lyrics. kind of J.R.R. Tolkien related way of describing things mixed with a little bit of R.A. Salvatore and J.K. Rowling..
Timo and I made a kind of mind map of what each of the songs present as a little story of its own under a larger story and once that mind map was made I started to write the lyrics by creating a kind of scenery in my mind of each one of the songs. Don't know anything about painting but I might guess that my style of writing lyrics is somewhat similar with the art of creating a fantasy based painting. SoT: I review a lot of albums and quite frankly often the musicianship of the players outpaces the vocalist. I'm not sure it it's because great vocalists are hard to find or because musicians have room to grow and vocalists tend to sound the same from album to album. But Anthriel is another animal altogether. Your vocalist is a rare gift whom sounds like he knows what needs to be done to serve the song. Do you have a process in working vocals and music to fit various themes and moods? Timo: Simo has a great skill to imitate persons and all kind of funny sounds so it's interesting and hilarious to try different "vocalist modes" in vocal recording sessions. We have Bruce Dickinson, Dave Coverdale and James Laborie modes for example! We record a LOT of vocal tracks and it is easy to communicate with Simo and we usually have similar approach for each song. Usually I have the vocal lines written before the session but sometimes it's interesting to see how Simo approaches the song. For example, the vocal melody of "Rhapsody of Fire"- verses, came from Simo and it just was so weird melody we had to make it happen. SoT: I've become a real fan of the symphonic metal genre but at times it can become predictable or gimmicky with female vocalists screaming every bridge while six violinists are punching Paganini to death. I noticed you approached symphonics with the same philosophy the band uses for everything you play. What attracts you to symphonic metal and how are you uniquely incorporating its parts into the Anthriel experience? Timo: I listen a lot of classical music and soundtracks. I like to think that Anthriel music is kind of soundtrack combined to metal band instruments. There is lot of keys, synths and orchestration layered to the background, which is the base of my composing, and I use drums and guitars only to add some rhythm around the musical theme. So if you cut off the band instruments from the mix, the arrangement works as an ambiental soundtrack. SoT: Touring is the bread and butter of many bands whom make their living playing music. But l've learned not all bands want to or have to tour to stay relevant. What are your plans and do you need to make adjustments in equipment to roll out the symphonic sounds? Timo: Yes, there is lot of tweaking and practicing what comes to touring but we are really looking forward of live shows as the band is full of energy as ever. SoT: Finland is one of the few countries I have yet to visit. Do you feel Finland has any special cultural, geographical or historical values that Anthriel can bring to life in its music? 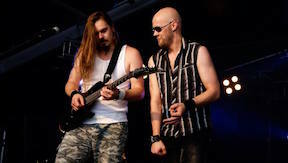 Timo: Actually I was going to use traditional Finnish instrument "Kantele" on "Oath of Darkness" intro. Kantele is a wooden instrument with strings. Simo: Well I think that all of those things already affect our way of writing music/lyrics for Anthriel cause we are from Finland. SoT: We all have influences in our lives that make an impact on how we communicate and create our art. What are the musical influences of Anthriel? Simo: Hahaaa! Easy one. Well each one of us has favorite bands and composers of their own and different things that give us inspiration so every player on Anthriel works as a "inspiration donor" when we meet and play or even compose some new stuff so basically we love to be influenced by each other of us in the Anthiel rehearsals and recording sessions. Symphony X's Michael Romeo speaks out!